A bright gaming future for the bar? From digital cameras to cash machines, it’s becoming harder and harder to find a machine that doesn’t run the original Doom. Now you can happily add the new MacBook Pro’s touch bar to that list. The mod comes courtesy of YouTuber ‘diffractive - b3ll’, who has managed to get the full game running on the OLED screen. As can be seen in the YouTube video above, this is hardly the best way to run the game because of how widely the bar stretches the image, but the photo that accompanied Bell’s tweet has us excited for the gaming uses of the touch bar in the future. The image shows the touchbar being used for the game’s UI elements, which could theoretically free up the main screen to show more gameplay. 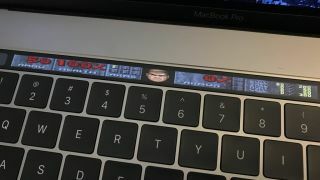 What if first-person shooters in the future used the touchbar to display your inventory so that you can select weapons without having to guess which weapon is assigned to which number? Or perhaps an RTS like Starcraft could use the touchbar to display your build queue, allowing you to simply touch items in the queue to edit them. Of course the big problem with these ideas is that despite a recent push towards MacOS as a gaming platform, the vast majority of gamers still use Windows for their gaming needs. Various keyboard companies have attempted to place screens on their keyboards in the past, such as Logitech with the G19s or Razer with the DeathStalker Ultimate, but without a standardised layout or API developers haven’t embraced the pseudo-second screen experience. But if Apple’s OLED touch-bar takes off, then we might see keyboard manufacturers banding together to make a windows alternative that could have some very interesting consequences for gaming.